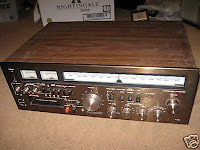 HIGHLY SOUGHT AFTER VINTAGE SOLID STATE UNIT! ABSOLUTELY FABULOUS CONDITION !This is a WONDERFUL sounding & AWESOME looking unit...very little use....EXCELLENT GLOSSY FRONT FINISH AND WOOD GRAIN! UNIT HAS BEEN TESTED IN ALL ASPECTS......RECORDS GREAT, EXCELLENT STEREO SEPARATION, ALL FOUR TRACKS CHANGE SMOOTHLY, UV METERS OPERATE PROPERLY, TAPE HEAD RECENTLY CLEANED. ALL KNOBS ROLLS EXTREMELY SMOOTH, ALL INPUTS AND OUTPUTS IN FINE ORDER. UNIT WILL BE SHIPPED VIA UPS GROUND WITH FULL INSURANCE AND EXPERT PACKING.